It is very difficult to determine exactly how the "Victoria" and "Ideal" phonographs were manufactured. It is known that Regal finished the cabinets and assembled the machines from parts purchased wholesale. Initially Stevenson likely did this himself, although it is not clear if he made the cabinets. When the company expanded in 1917, a factory was set up on Church Street. Regal possibly began to manufacture cabinets in the Church Street factory, but the date may be as late as 1921 when Ideal Cabinets Ltd., came into existence. Since Regal employed a "Finisher" from 1917 onwards, some cabinet work did occur.18 Later, the factory relocated to West Toronto Junction, while the offices and retail store remained on Church Street. The cabinets were constructed from wood and wood veneers which were then hand-polished to a gleaming shine. The phonograph machines continued to be assembled from purchased parts. Regal’s suppliers included W.H. Banfield & Sons Ltd. (a Canadian manufacturer of phonograph motors located at 370-386 Pape Avenue, Toronto), and General Phonograph Corporation (formerly the Otto Heineman Phonograph Supply Co., an American firm with a Canadian office in Toronto) among others.19 Transfers bearing the "Ideal Perfect Tone" mark were then applied to the machines. Regal produced at least eighteen different models in its seven year history. It manufactured both tabletop and floor models, all of which were handoperated and were capable of playing all makes of records without the use of special attachments. One of the early "Ideal" phonographs, Model 2, was a "mahogany finished cabinet, equipped with a double spring, fibre geared motor, universal tone arm and jewel point. "20 This tabletop phonograph retailed for $25.00 in 1917. 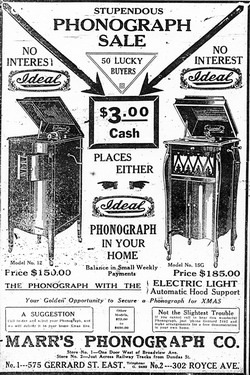 Oddly enough, more information is available on the "Premier" phonograph, the successor to the "Ideal". The cabinet phonographs are identical in appearance, and since E.A. Stevenson was responsible for the manufacture of both machines, it is safe to assume that many of the specifications would be similar too. The "Premier", like the "Ideal", was equipped with a tone modulator and a convertible tone arm, which permitted the playing of any make of record. The motor had a heavy cast frame, two detachable barrels made of spring steel, bronze meshing gears, was graduated for seven different speeds and was capable of playing three records on one winding. The phonograph had a twelve-inch turntable. Models were available with either a fretwork grille or with doors. Weight was approximately 75 lbs.21 Dimensions and finish varied with the model. Appendix A consists of a table which provides a description of the known "Victoria" and "Ideal" models and their prices. Model information comes primarily from company advertisements. Based on their illustrations, there doesn’t appear to be much difference between some of the models, although newspapers were notorious for using stock images rather than true illustrations. Toronto Evening Telegram, Dec 23,1920 pg 21. The same models were distributed by Victoria Music at same price. Note error in models - The #14 is a really a #12 & vice versa. 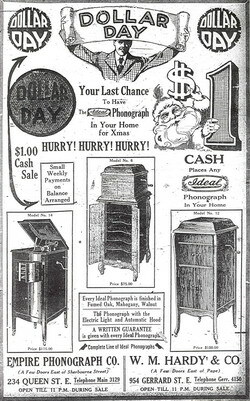 Regal tried to maintain its sales in northern Ontario by distributing its machines through the Victoria Music Club in 1920. Although there is no absolute proof, evidence indicates that Regal manufactured machines for the Club which labelled them "Victoria" so as not to "conflict with the manufacturer’s regular trade. "25 Club members were offered a choice of Model No. 6, 12 or 14 and a monthly selection of records for reasonable payments. 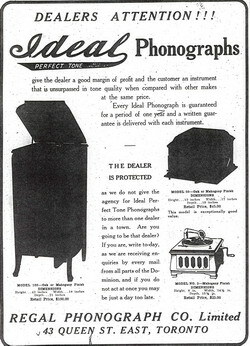 This sales technique was a popular method of selling phonographs and records in the early 1920s. Several major retailers launched clubs with special sales plans. Unfortunately, not much is known about the Victoria Music Club, other than one distributor in New Liskeard, Ontario. Only two months of advertising later, and the Victoria Music Club disappeared. After this episode, Regal’s marketing strategy changed and became more focussed upon Toronto. The company hired W. Norman Martin as its salesman. Martin, who also became secretary-treasurer for Ideal Cabinets, greatly expanded the number of retailers. 26 Although it is impossible to determine Regal’s complete network of dealers, there were at least seventeen retailers who sold Ideal Phonographs in Toronto in 1921.27 The majority were stationers, jewellers or tobacco shops who sold phonographs as a sideline, but there were several phonograph retailers among the group. Regal also continued to operate its retail store on Church Street. A cursory review of a few other newspapers and directories beyond Toronto did not reveal any additional retailers. My old phonograph cabinet is embellished with three gold maple leaves and the word "Victoria" scrolled under the lid. Part of Regal’s patented lighting system also remains. On the back is the small brass plaque identifying it as an "Ideal" phonograph, manufactured by the Regal Phonograph Company. It looks very much like a Model 14 "Ideal" phonograph and it may be a relic of the short-lived Victoria Music Club or old "Victoria" model stock. I guess I will never really know. Sadly, I will also never know if it had a perfect tone, or who danced to its music. But I do know from where it came, and I am pleased to have this small piece of Canadian music history in my home. 18. City of Toronto Archives, City of Toronto Assessment Rolls, Ward 3, Division 5, 1916-1918. 19. Advertisement, Hughes Sales Co., Toronto Star, 7 July 1922, p.20. 20. "The New 'Ideal'," Canadian Music Trades Journal, Volume XVII, No.8, January 1917, p. 65. 21. Advertisement, United Factories Outlet Co., The Globe, 13 April 1923, p.5. 22. "The 'Ideal' Phonograph," Canadian Music Trades Journal, Volume XVII, No. 6, November 1916, p. 72. See also Regal Phonograph Co. advertisement, p. 42. 23. Library and Archives Canada (LAC), RG 105, Vol. 68, docket 88771. Letter from E.E.W. Curry, O’Connor & Wallace, Barristers & Solicitors to the Honourable Minister of Agriculture, 5 October 1916. 24. LAC, RG 105, Vol. 68, docket 88771. Trademark application for Ideal Perfect Tone Phonograph, October 1916. 25. 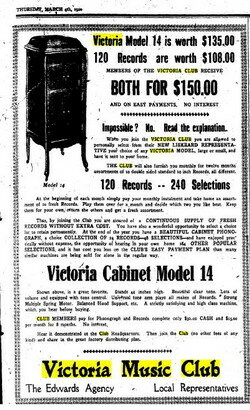 Victoria Music Club advertisement, New Liskeard Speaker, 19 February 1920, p.3. 26. The Toronto City Directory, 1921 (Toronto: Might Directories Ltd., 1921). See also the Toronto City Directory for 1922. 27. Regal Phonograph Company advertisement, Toronto Evening Telegram, 4 November 1921, p. 26. 28. Advertisement, Hughes Sales Co., Toronto Star, 26 May, 1922, p.10. Many thanks to Sarah Fontaine and Morag Carnie at the Archives of Ontario for all their assistance. Larry McNally, Bryan DeWalt, Arthur Zimmerman and Marcel Barriault were very patient with all my "exciting" discoveries and provided much useful advice.